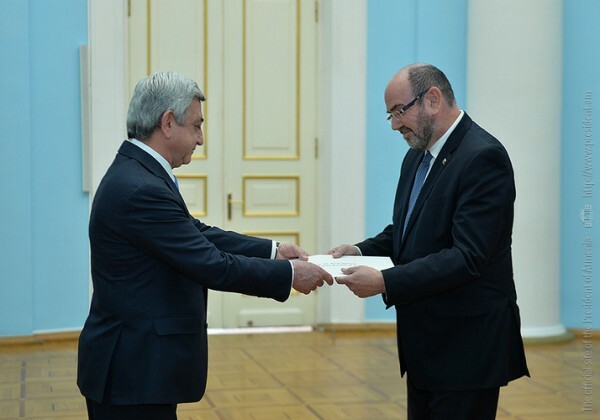 The newly appointed Ambassador Extraordinary and Plenipotentiary of Israel to Armenia Eliyahu Yerushalmi (residence in Jerusalem) presented his credentials to President Serzh Sargsyan. The President congratulated the Ambassador and underscored that the Armenian authorities stand ready to support activities of the Ambassador, aimed at the strengthening and development of the Armenian-Israeli relations. Serzh Sargsyan noted that the centuries-long Armenian-Israeli historical ties obligate to invigorate and give a new quality to the interstate relations. The President highlighted the importance of the recent enhancement of the interparliamentary and public relations. Ambassador Eliyahu Yerushalmi noted that the message of his government, which he has brought to Armenia, is the following: Israel desires to have open and advanced relations with Armenia, and as ambassador he will do his best to make that message a reality as soon as possible. Underscoring that Israel has deep respect towards the Armenian people, Eliyahu Yerushalmi said that it is a great honor to serve for the strengthening and development of the interstate relations of the two ancient peoples. At the meeting, the parties discussed the opportunities and prospects for the development of the Armenian-Israeli relations in different areas. The interlocutors exchanged views on the regional issues and developments.